Well might as well start back in with a bang, or pop, or hiss, whatever a blown gasket sounds like. This was my all time dumbest purchase a couple years ago. I bought it running on two of four cylinders, and didn't even notice! I have an excuse, but well, I don't think you're going to have much sympathy. Here goes anyway. I'm a John Deere owner -- a 1951 Model M, which I have worked on and with for a dozen years. It has been vital to our lives here, dug the foundation for the house, hauled logs to the sawmill, plowed snow, scooped the pond, plowed the garden, moved milling machines and everything else... I'm totally familiar with it, know its every mood and sound. 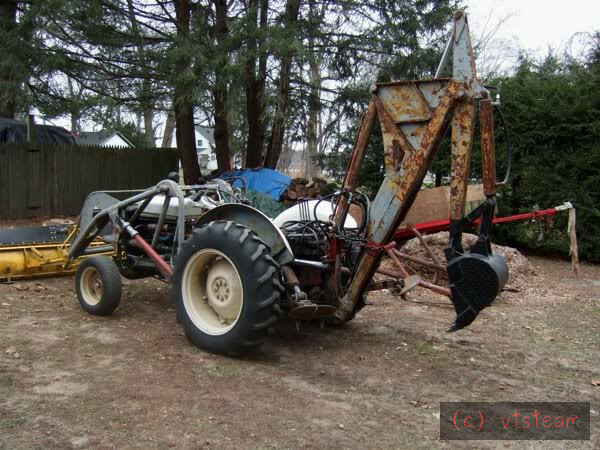 But then I see an ad in Masachusetts Craig's list for a Ford 850, complete with a backhoe and loader (my Model M only has a pathetic rope operated pond scoop. And it's 54 horsepower compared to the green tractor's 18 (not that I'm complaining about that -- that 18 was "real" horsepower) at a price I could afford. So I traveled an hour to look at it -- the owner started it up and operated the hoe. 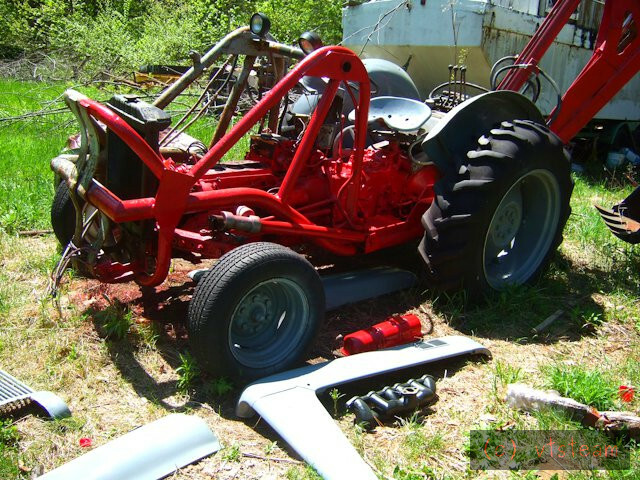 It looked like hell -- all patches of different color paint and rust, no sheet metal on it (though stored and available with the tractor) and a lot of angle iron patches and cruddy looking farm welds. But it ran, the hoe worked, plus the guy would throw in a bunch of other odds and ends, a snow plow, extra loader, etc. and to top it off, he'd deliver it. So I put a deposit on it and waited eagerly for the arrival. When it got here a week later, the former owner seemed to have a little trepidation about crossing our stream embankments to get it near my shed. That's no problem for the John Deere, but I figured he must have been worried about the weight of the boom, or something. He did a lot of revving before crossing the 6 inch deep stream and nearly stalled it out. A bit odd, but I thought maybe he was an inexperienced tractor owner (he lived in a split level ranch house with about a quarter acre plot -- why he had a tractor at all, I couldn't guess). I was used to the sound of my Model M. It has 2 cylinders and they fire 90 degrees apart. Hence the common name "Johnny Popper" for these tractors. The Ford sounded okay to me when idled at the owner's house. Not too diffeent than the Deere. I of course hadn't brought a gauge with me to check compression, and never even pulled a plug wire while it was running to make sure it slowed. Just blithely assumed he'd mention something as important as half the engine being dead! Winter snows came early, and I ended up just covering over the tractor with a tarp -- worried I had valve problems after checking compression with oil, etc. or other bad news. Anyway, two years later, here I am, pulled the head and low and behold, a blown head gasket -- that should be an easy fix!! Well not quite. Checked the head and it's about 12 thou warped in the middle pulling up off the deck where the blow was right between the center cylinders. So I'm thinking about what to do about it. Which is why I started to look for that fly cutter I though I'd made last year, but probably didn't. Anyway, open to all suggestions and help on this -- I'm happy casting iron and building little engines from scratch, but worried about screwing up a real one, for some reason. I set the head up on the mill to see if I had enough travel. No, I don't. Travel is about a half inch short of the length of the head. Steve, if your travel is only 1/2" short, then a generously sized fly cutter will easily cover it all. As I'm sure you know, you need as much mass as reasonably possible in the body of the cutter. I've had good results with a suitably mounted cast iron 'chuck back plate' with the tool bit mounted in a drilling about 1/2" from the edge and secured with a radial allen cap screw. Has the block suffered in any way? I'd be very tempted to test it with blue and a suitably flat bit of float glass. Quite likely to be somewhat eroded between those two cylinders. 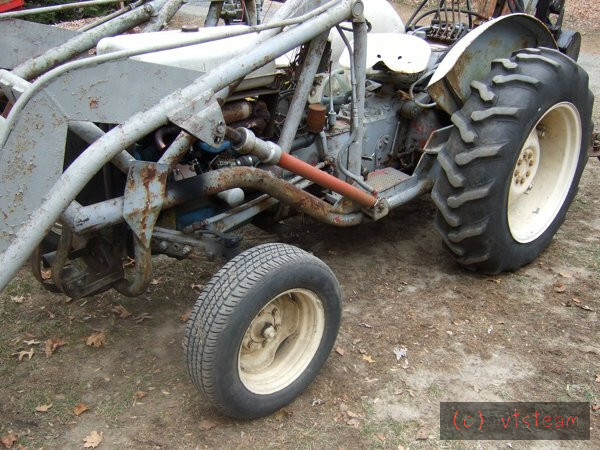 Just googled Ford 850 and found a forum AntiqueTractorsForum.com maybe there can be some help there? Andrew, I've done just fly cutter work on the iron I cast last year, and the steam engine conversion head. But never attempted a full size automotive head. So I don't have a lot of experience with flycutters, other than the few problems I've come across, ie this is coming from machinist ignorance. So I don't know how you start a large fly cutter that is already overlapping one end of the head. Do you just come down in Z and start cutting in the first quarter of the work? Then the most of the back part will be cutting on the back side of the fly cutter. And the middle of the block will probably show tooling marks from the back and forward side of the cutter. Finally the far end will show tooling marks from the forward side of the cutter. Then do you lift the spindle, or switch off to return to the starting position to take another pass? So if the fly cutter is 2-1/2" radiuus and the head is 1/2" longer than travel, I would need to start cutting 2-3/4" minimum in from the starting end. The local old timey machinist in town told me that to cut a head I should have a tiny amount of forward tilt to the spindle, but not too much or it would make a gouge shaped cut. Not sure if I believe forward tilt is good, seems like it would cause problems if I tried to start past the end of a block in this case, since one end would be cut only by the leading portion of the fly cutter and one the trailing edge, and they would be a "tiny amount" different. "But not too much..."
Seems like I'd want it trammed as perpendicular as I can manage, instead? But like I said, I'm coming form ignorance here, please chime in. Thanks Sid for the forum reference -- I do know about those forums and have even been on them before, but they generally come from a "bring it to a valve shop" perspective or "buy a new one". They generally aren't home shop machinists trying to learn to increase their skills. I kind of figured MM might be the place to ask people for help, since you'd understand why I'd ever want to do this myself without specialized equipment, or by using archaic methods! I've even considered hand scraping, since I built my lathe that way, but sure wouldn't want to scrape .012" off. If I could get the head milled close enough to scrape to final bearing that would be do-able. 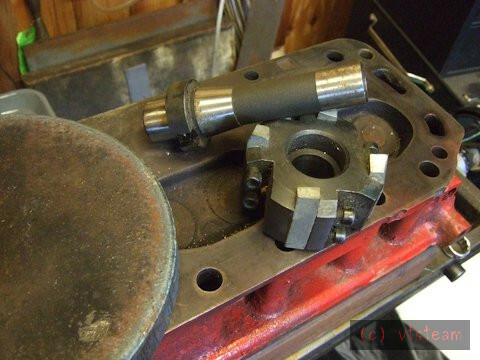 I've also read about the need for special surface roughness required now to accommodate gaskets in modern tight tolerance engines, where hand scraping came up as a topic on Practical Machinist forum. But I wonder if that would really be a problem -- this is an early 50's tractor engine, and compression is in the 6 to 1 range. I'm sure I could roughen it, also, if need be. Andrew, the center where the gasket blow was is definitely lower, but it seems to be a relatively uniform bow out to the ends of the head. I put an indicator in the mill collet and traversed the head and there isn't a sudden dip in the middle. Total bow is about .012" IN 21 inches. I have also read some about localized heating of the upper(convex) surface of a head while applying pressures from the ends of a head to remove or reduce a warp. Localized heating seems a little risky with cast iron, and I think they were talking abou a greater degree of warp than I have. In case you want to see the 850, as purchased where it stood, here it is in all its glory! Notice the pickup truck snow plow with its lift gear way out on the end of the loader arms.... must have been tough maneuvering that way! I thinke he only plowed his 30 foot blacktop driveway with it. Personally I would avoid heating and bending. As time passes it will probably relax back and give disappointing results. I can see the logic in a VERY slight out of tram, so the fly cutter isn't cutting on the heel, but I don't think it's a good idea in this case. You'll get crossed over cuts in the majority of the face but not at the extreme but the difference in material removed will be insignificant in this application. I'd set the head to be symmetrical on the bed so the 'under travel is the same at both ends, mark up your highest spot using a gauge, fit the fly cutter and bring it over the high spot having wetted down a scrap of cigarette paper of known thickness there. Adjust to wipe the paper off and zero your Z DRO, move the cutter so it is off the edge, apply a few thou down feed and start cutting. Repeat until you've removed the least possible material to clean up your 'low spot'. The ends will not have the crossed cuts - if you really need to they can be cleaned up with emery cloth on a plate glass surface but that is probably gilding the lilly. Before all this if I were you I'd have a practice run on any old bit of suitably sized scrap. That method of starting the cut makes sense to me, Andrew. I don't have a DRO, but that's not a problem. And no glass table, but I do have an old cast iron surface plate I won in an auction. Never have used it. 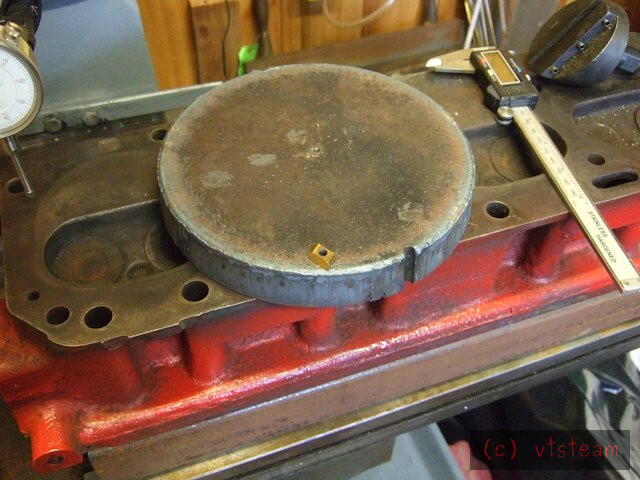 This morning I stopped down at Lester's machine shop (the old timey one with all the overhead belt drives and giant iron machines) and after we talked a bit about what I wanted to do, he sold me a 1" thick by 7-1/2" diameter steel drop for $10. I'll definitely try first on scrap. I'm having second thoughts about the big chunk of steel for a fly cutter. I just seems to big and heavy to use in my mill/drill. Gut feel: 3 inches dia, or so, would be the maximum I ought to be using, even with a single point tool. The head surface is 6-3/8" across, so that would mean at least two passes to cover. I know it's better to do it in one pass with a big cutter, but if I do the sandpaper on surface plate cleanup afterwards, will it be a problem that it was cut in two passes instead of one? I could make a 3+ inch fly cutter with the inserts I have. 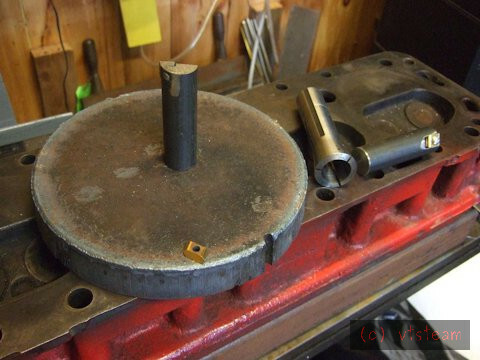 Or I could use a classic style fly cutter I already have -- the type that take a 1/2" HSS lathe tool blank. The tool can protrude maybe only a 1/2" to make the 3+ inch pass width. The cutter is 3" dia, pretty solid and has A 3/4" shank. That would be easiest. and even mentions cutting beyond machine travel. I wish there was abetter description here of the cutter shape. Not quite clear on how it was ground. I would be inclined to follow your advice from your old time machine shop. The cuts that your going to make are going to be very light to take out 12thou. Your well balanced large diameter fly cutter would have plenty of inertia to cut and you would eliminate any risk of out of flat due to making two cuts. The shape of the tool is like a lathe tool if it's at right angles to the work piece. Thanks Matt. Yes that does seem right. The only thing i'm worried about is the weight of the cutter -- 1 inch (25 mm) plate -- it's about 11 pounds (5 kg). Probably 12 with a shank. It's just hard to picture swinging that in an R8 collet from my round column mill drill. I'm not as worried about the diameter of the cut as I am the weight of doing a cutter this way. Thinking I should have planned to make the more usual bar type rather than a full round disk. Maybe 1" is overkill. I do have some 1/2" plate. vtsteam, you say the head has a pretty consistent curved bow of 0.012" over its length. This is a less serious defect than if there was a pronounced dip between the 2 centre combustion chambers and is likely to have a better outcome when skimmed. If your going to fly cut on a machine that is slightly short on table travel then your cutter needs to be set parallel to the machine bed(no tilt). Because of the gradual bow you describe I would suggest checking the head studs or bolts to see if they have been over tightened and stretched. If they have been stretched you may notice some necking or waisting on the unthreaded portion....OZ. I agree Mathew,I would also go with the big fly cutter and take light cuts and make sure it is well balanced. ....OZ. 1" does seem a bit of a lump but if it is in balance it should be ok. It really depends on how big in diameter the drive shank is.....OZ. Thanks Manxmodder -- I will check those bolts, then. Lester the machinist in town didn't know my bed travel was short, so his advice was well taken. The curve of the bow according to my indicator seems to happen fairly consistently along the head, maybe increasing a little more rapidly towards either end. So I guess most of the material will be removed there. Just found in the shop manual that .005" is acceptable bow across the whole head. .003" across any 5" length. I've run into another small problem. I seem to have lost one of the small rotating caps the go on the exhaust valves. It would be a pretty simple turning job to make a new one using the diagram and description of tolerance in my shop manual, and I have the other 3 as examples, but I imagine they're probably hardened, and I wouldn't know to what degree to temper them. Maybe I can find them available online still. I tried finding it outside the door of my shop with a metal detector, but fat chance! There's way too much scrap metal there in the ground. Thank again for your help Manxmodder and Matt! The less rigid your machine the more advantageous is a heavy lump as a fly cutter body. This is particularly so with intermittent cuts as the mass reduces chatter. As you are cutting cast iron your rpm will be fairly low so it shouldn't be too terrifying so long as it is well balanced. Good point, Andrew. I guess the main thing I'm worried abut is that the long arm and frequent interrupted cut with a heavy weight acting downward on the arbor might cause it to shift downward in the R8 collet, which could be a real disaster to both the head and the tool, and maybe the mill spindle. I'm not sure what my maximum arbor size is -- I think I have a 7/8" collet in R8, I'll check. Whatever that is, that will have to be the arbor size. Probably would have been better if I had an R8 blank I could weld directly to the fly cutter disk, so I wouldn't use a collet at all. Spring up isn't good in a tool like this for accuracy, but it does give you a little protection over massive solidity. I guess the best to hope for if I use this disk is that the insert would shatter in an accident. I have had parts shift in the past on the mill table after several passes with an interrupted cut, my own fault, true. I know what can happen even with much smaller tools. It's a real good lesson, but kind of makes you gun shy in looking at future rigs. Here's the tractor with the head off. I've been scraping cleaning and painting a little as I go. I also have a new manifold for it shown here. Here's the proposed 11 pound fly cutter blank and insert next to a store bought 3" cutter. If I'm using carbide on cast iron, does that mean 600 fpm @ ~7" dia or about 380 RPM? I'd run at about 100 rpm for a first starting point until I were sure things were safe and balanced, and maybe wind up the revs a bit if that went ok. HSS wound be fine for cast iron and much simpler to mount as well as tolerating intermittent cuts better. I'd find a broken centre drill or end mill of about 6 or 8 mm diameter, drill a hole and pop it in secured with a radial hex socket screw bearing on a ground flat from the outer edge. Grind a cutting edge and off you go. Thanks Andrew. 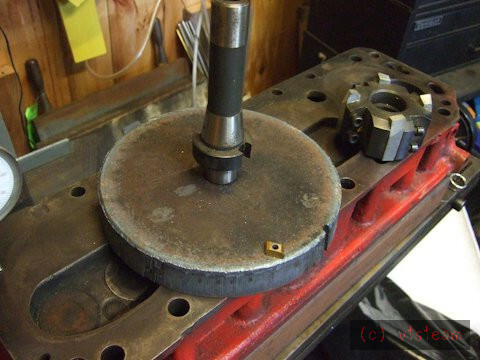 HSS would look like 50 rpm, which I can't do -- I think 110 is the lowest speed on the mill drill.. I placed a 7/8 end mill I made earlier on the blank to see what a shank would look like. Just looks weak to me, and undersized for the purpose. There's a 7/8" R-8 collet nearby. So I'm thinking of boring the blank 1.063" to take the R8 shank stub end, and actually welding it in place. I can plug weld the end, and also weld around the flange on the top side. Then the R8 shank fly cutter can't shift, as a 7/8" collet mount plain shank could. The draw bolt locks it in place and all dimensions are a lot better -- plus there's a flange to transfer the stresses better. This will be a permanent tool, and probably see more use than the 4 cutter one did anyway. Years ago (actually 1979 !!!) my first mill was a 'Mill Drill' with a 3 MT spindle and came with one of those cutters. It actually didn't do too badly, but how many of the tips were actually cutting was open to debate. Excellent for hogging out. 7/8 is much stronger than you think, think about small car drive shafts, around that size,you haven't got that much power going through to your fly cutter! I agree with Andrew about the HSS cutter, slower than carbide and much easier to mount! Thanks for the sound suggestions gents! I'm sticking to the R8 arbor, but will look tomorrow to see if I can't preserve the mounting method. As I remember it there are a retaining bolt in the end and two keys that slot into the older fly cutting head to keep it from rotating on the arbor. If it isn't too big a task, I'll do the same with the new fly-cutter blank. Otherwise I'll weld it. If welded and I ever do want to use the older cutter as a hogging tool, I only have to make another arbor. Simple, since it doesn't have to be R8, it could be, ahem, 7/8" rod right? Matt mounting the insert is just as easy as mounting a HSS tool -- just mill a vertical slot in the periphery and drill and tap a retaining hole for the screw -- I've done it before -- see the first of the three pics above and look on the right side to see an end mill/fly cutter I made the same way, using the same insert. It was used to clean up my iron sand castings last summer and worked a treat! But, guys, not to ignore your good and helpful advice, I'll also make a mount in this fly cutter for a HSS tool, so I can do either. There's about 20 inches of periphery and plenty of room to make additional tool holders. It will always be used as a single point cutter, but with a choice of tools. Best of both worlds? Now back to my dumber antics, the first step, no matter what, was to mount the blank on the lathe to clean it up and get a pilot hole started. You'd think I could manage that easily, having added shelving, rearranged tools, built benches and cleaned and organized my shop last fall. But no. I can't find things any more! Where was that stupid shim I needed for my non standard 4 jaw chuck mount to prevent it from hitting the Craftsman gear shift knob? Nowhere I could remember. I know where it used to be -- right next to the 4 jaw on the board I put across the end of the ways. But that's all gone now the lathe is moved to the other end of the shop. I haven't done any machine work since I rearranged everything 4 months ago. Everything is too damn organized and out of sight! What was I thinking? Well that shim was a makeshift solution anyway. I really should turn down the back of the 4 jaw chuck and leave a boss to get clearance at the periphery to accomodate the gear shift knob. So that's what I did this afternoon instead of make the fly cutter to cut the head to replace the head gasket to fix the engine to use the tractor to run the backhoe to dig out my pond where it filled in from the flood from that hurricane Irene. Phew! And I did. The 4 jaw now mounts properly, and it has the fly cutter blank clamped up for turning tomorrow.